Looking for the best chocolate chip cookies recipe? 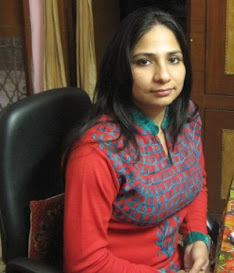 Perhaps you are here for airfryer recipes Indian. You want to omit chemical agents in your choco chip cookies, right? Here's the best whole wheat chocolate chip cookie recipe for you all. Well, the oats chocolate chip cookies here use oats and whole wheat and are sweetened with organic jaggery. 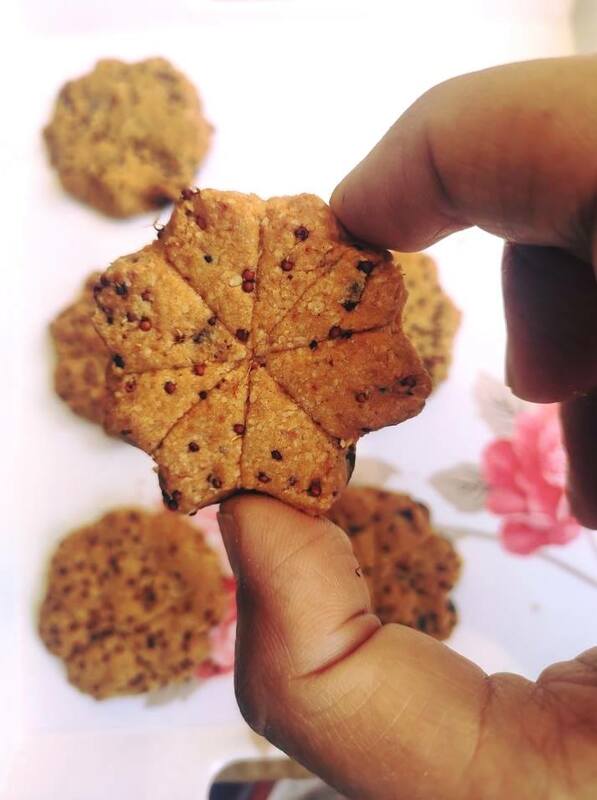 What adds a powerful punch to the chocolate chip cookies without brown sugar is the addition of ragi sprouts. Perhaps the bite and crunch of sprouted ragi or finger millet make these choco chip cookies without oven and baking powder, soda truly addictive. So these are sincerely healthy cookies for your tiny tots, which makes this a kid-friendly recipe too. Here's another addition to my cookie baking without baking powder, soda series. I had always wondered what's so special about choco chip cookies that's driving everyone crazy. 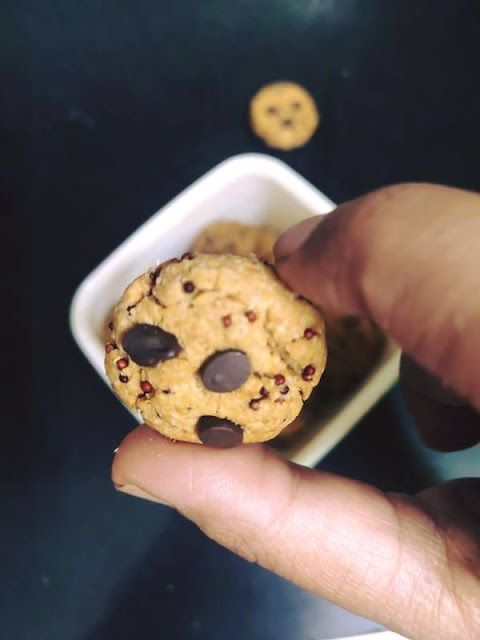 But when I tried these munchies, I have realized these are addictive so much so that a no-chocolate lover like me has fallen in love with choco chip cookies. There's something so special about these beauties. Finally, the wait is over. Many of you have been waiting for me to share choco chip cookies recipe. It has taken me a while to come up with one, as I wanted to use homemade chocolate chips. But I am yet to make choco chips at home. Got a packet of chocolate chips from my hometown recently, as Paro requested me to make her favorite cookies. I could not say no to my darling niece. Here comes our oats choco chip cookies without baking powder/soda and refined sugar. These are healthy, power-packed, and nutrient-dense and a perfect match for your kidoo's snack time. PS: I' m not too fond of chocolate, but the choco chips in there make these cookies addictive!! Any guesses what these tiny bits are? Keep guessing until you peep into the recipe. What's in healthy whole wheat chocolate chip cookies that's driving you crazy? The batch of oatmeal choco chip cookies without baking powder, soda is addictive, nutritious, and oh so yummy. I am already addicted to these beauties. Are you? Yes, this simple cookie recipe is all about crunch, flavor, and nutrients. On top of it, this is another from my airfryer recipes Indian series. 1. Whisk together sifted jaggery powder, extra virgin olive oil, and solid ghee (I refrigerate ghee for 30 mts before using so that it becomes solid - solid ghee delivers amazing results for me). Whisk until it all looks pale and creamy. The idea is to turn the mixture light brown. This is where your muscle power comes in handy. I like to use a whisk, but you may use a hand mixer instead. 2. Add a pinch of salt and whisk for a few seconds. 3. Add thick curd (without water - check the video here on how to make hung curd easily at home without cloth). Whisk again for 1 minute until it all looks well mixed. 4. Sift whole wheat flour and gently mix. Add 1tbsp choco chips and mix. 5. Sift oatmeal (check the video to make powdered oats at home) in batches and keep mixing gently. 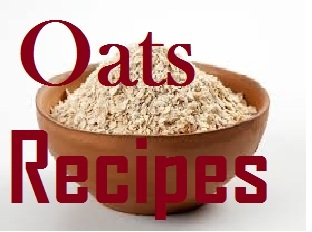 You may need to add extra 2 tbsp of oatmeal to reach the right consistency. The idea here is to get a loose dough but not too sticky. My cookie doughs from my baking without baking powder, soda series are soft and loose. Why? Well, here lies the secret to making crunchy, crispy bites. But a little too loose could make your cookies soggy from inside. So make sure you get the right consistency. Always check my videos to get more insight into cookie dough making for beginners. 6. Add the remaining chocolate chips and mix. 7. Stir in sprouted ragi/finger millet. 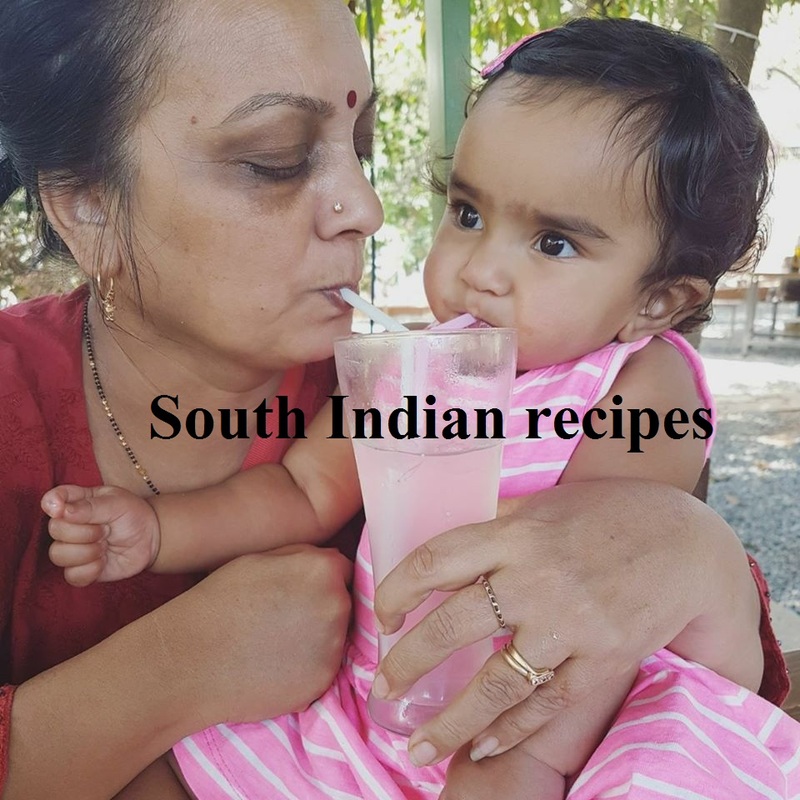 The reason for using ragi here is my love for this amazingly healthy millet. Packed with calcium and iron, ragi is my favorite sprout. Believe me or not, sprouted, roasted ragi is a crunchy snack on its own. I am so fond of it. 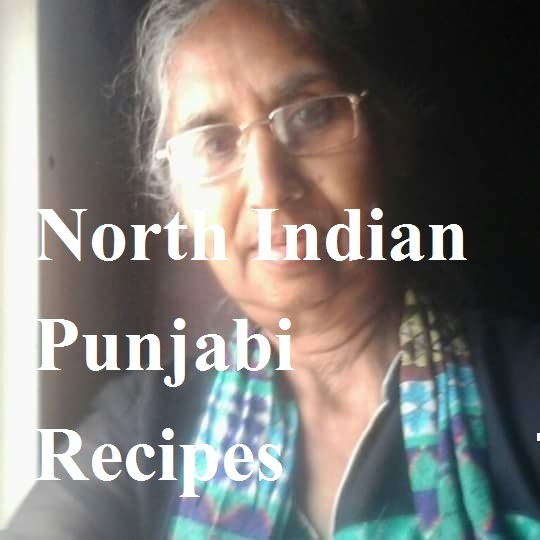 So I wanted to give you another recipe of ragi sprout uses. Munch on these crunchy sprouts - (my mouth is literally watering at this thought). 8. Preheat the oven/airfryer/convection to 160 degrees for 5 minutes or more. Airfryer can be preheated for 5 minutes only. For oven/convection/otg, preheat for 10mts. 9. Spread out the whole wheat chocolate chip cookie dough into a thick roti - three times the width of a chapati should be okay. Make roundels using a cookie cutter or bangle. You may use a fork to make insertions or a knife to create a flower cookie design. Check the video to see how I do it with hands only. 10. Bake/airfry for 18-20 mts at 160 degrees. You know your machine better. My airfryer takes 15-20 mts for cookies. Yours might take more or less, as temperature settings vary from machine to machine. 11. You may even choose to make small lime-sized balls. Press gently with palms. 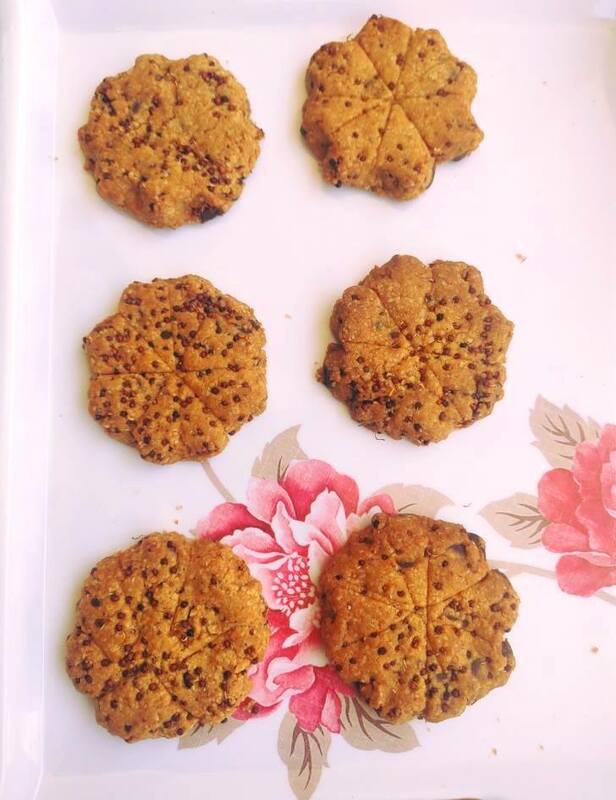 However, I loved the flattened flower cookies more, as they are more crispy and crunchy cookies without baking powder, soda. 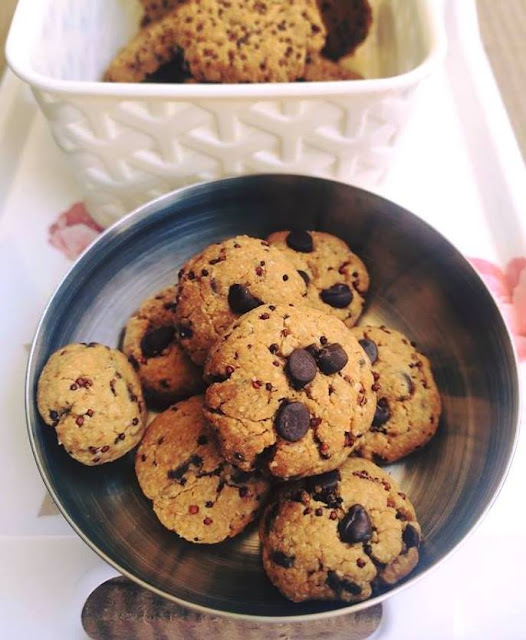 12.The oatmeal chocolate chip cookies without oven can be made on a tawa or in a cooker. For a cooker chocolate chip cookie recipe, it's best to make the thinner version of these cookies. Avoid opting for the balls here. I will try out the whole wheat chocolate chip cookies eggless on a stovetop and share the results with you. 13. Allow choco chip cookies to cool down before munching on these crunchy beauties. 14. Remember, I forewarn you that these are going to be an addictive batch even for no-chocolate lovers. Believe my words or bake a batch of whole wheat choco chip cookies eggless to find out yourself.